English or Welsh Wine is made from fresh grapes grown in England or Wales and produced in UK wineries. It should not be confused with the inappropriately termed ‘British Wine’ which is the product of imported fruit concentrate that is made into wine in Britain, and usually contains a percentage of grape juice. ‘British’ wines are not always wines as defined by the EU which specifies that wine can only be the product of fermented freshly crushed grapes. 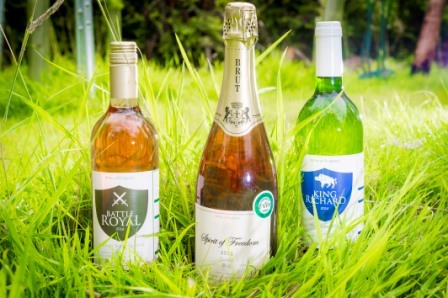 Scotland has four very small, amateur vineyards and as yet there has been no Scottish wine for sale.True English / Welsh wine is likely to state Wine of England / Wales on the label. See what wine buff Oz Clarke has to say about English wine… www.mirror.co.uk Our Rothley wines are most definitely Wine of England. YouTube To understand more about wine…..
https://www.youtube.com/watch?v=_UaS743_aEs&feature=youtu.be 3min clip explains about the flavour of wine and difference in cool climate wines. Clear, simple explanation of very basic wine chemistry. Highly recommended viewing. https://www.youtube.com/watch?v=_n-IjL692WI&feature=iv&src_vid=_UaS743_aEs&annotation_id=annotation_3536083573 Are wine baths a waste of money? See what wealthy Americans are putting in their paddling pools and hot tubs! Fun viewing. https://www.youtube.com/watch?v=ivMewfj3WLE The Chemistry of Wine – a lengthy and academic explanation of the chemistry of wine.